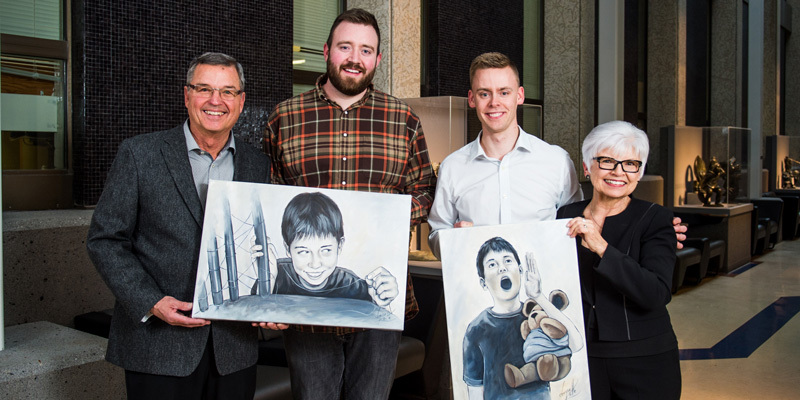 The Haddocks presented Evan and Bryan with illustrations by Denise Klette from Maureen's book "Get a Bigger Wagon"
The 10th Annual Gordon and Maureen Haddock Entrepreneurial Speaker Series took place at the Edwards School of Business on Thursday, March 16th. This year’s event, "From the University to the Real World" featured Bryan McCrea and Evan Willoughby, Co-founders of 3twenty Modular. 3twenty Modular is an innovative Saskatoon-based company that builds modular buildings for the mining, oil & gas, government, education and residential markets. The co-founders appeared on CBC’s hit TV show Dragons’ Den, where 3twenty successfully slayed the dragons, gaining W. Brett Wilson as a partner. Since then, 3twenty has become a leading designer and manufacturer of modular buildings. Under Bryan and Evan’s leadership, the company has built a reputation of innovative design, high quality, and customer service. During the Haddock Speaker Series Bryan and Evan illustrated the real world possibility that when a business student connects with an engineering student, to develop an idea, they can grow a multimillion-dollar business. Students, faculty and community members joined us to hear these young entrepreneurs share their ever-evolving story and their interest in new businesses.